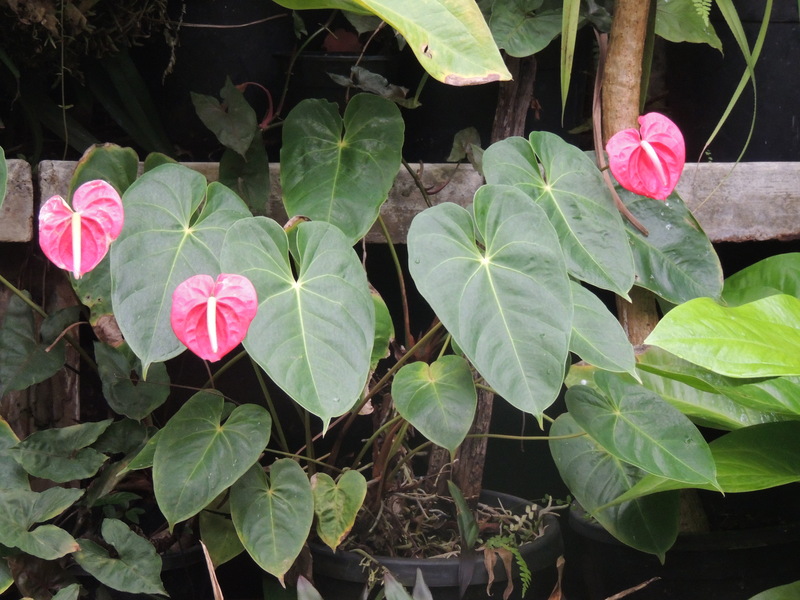 Recently, whilst enjoying the Royal Botanical Gardens Melbourne, we visited the Tropical Glasshouse. I've thought long and hard about writing a post about the glasshouse, because what I know about tropical plants would fit on - I was going to say a tropical plant leaf, but they seem to have quite large leaves, so it would have to be another kind of leaf: a salvia leaf, perhaps. However, the visit was absorbing and the plants unusual to me, and I thought I would share it. The building of the glasshouse began in the early 1900s but it has been added to twice since then. It is heated by natural gas. The minimum temperature is 16 degrees C (obviously this climbs higher during the day), and humidity is about 70% or more. We certainly noticed the difference when we entered it on a grey Melbourne day. All the plants are in pots, so repotting is an ongoing business. 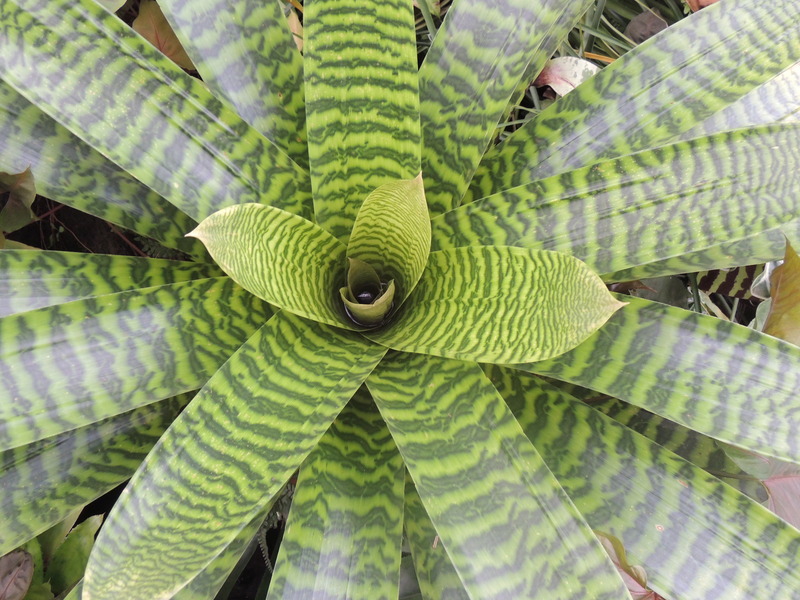 There were many different Bromeliads, so fascinating with their varied leaf designs: zig-zaggy stripes, green splotchy dots on purple, greyish-green with shocking pink tips and white pinstripes. 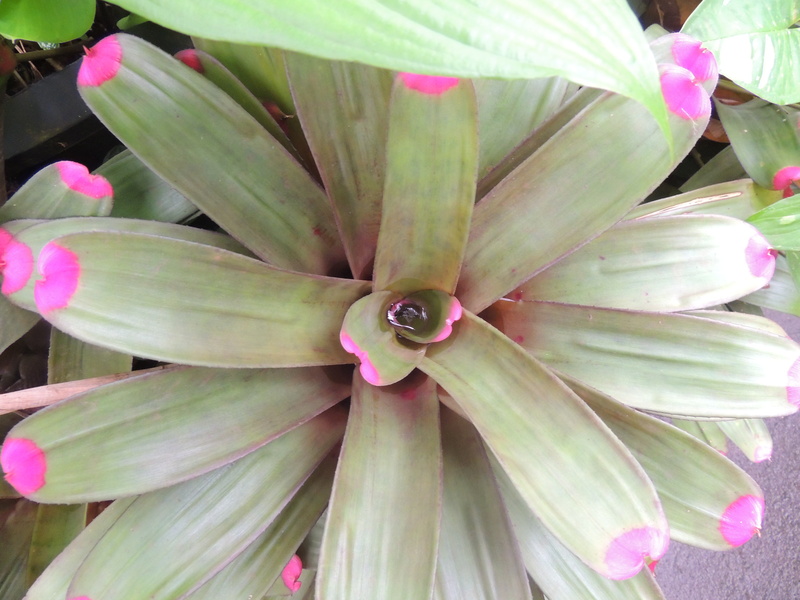 Bromeliads always have a little water tank in their centre which needs to be flushed out periodically. Mosquitoes can breed in them which also makes it a good idea to do the flushing. 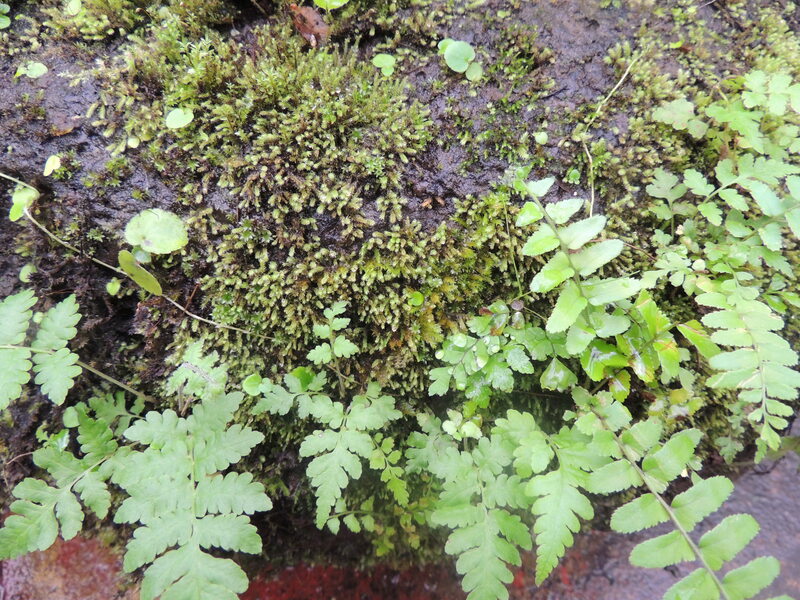 These plants are epiphytes and don't need to be in a lot of soil. I've learnt that they do just as well in orchid mix or sphagnum moss. 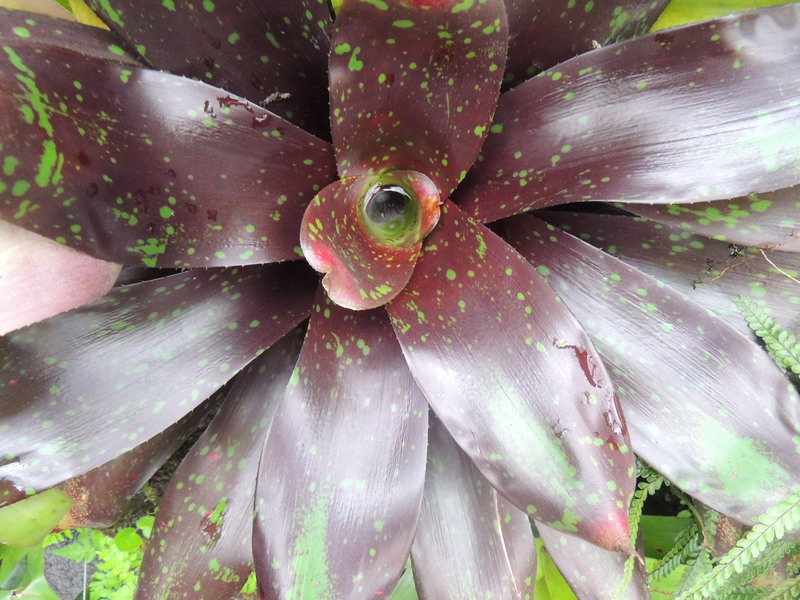 Unfortunately there were no flowers on the bromeliads when we visited. 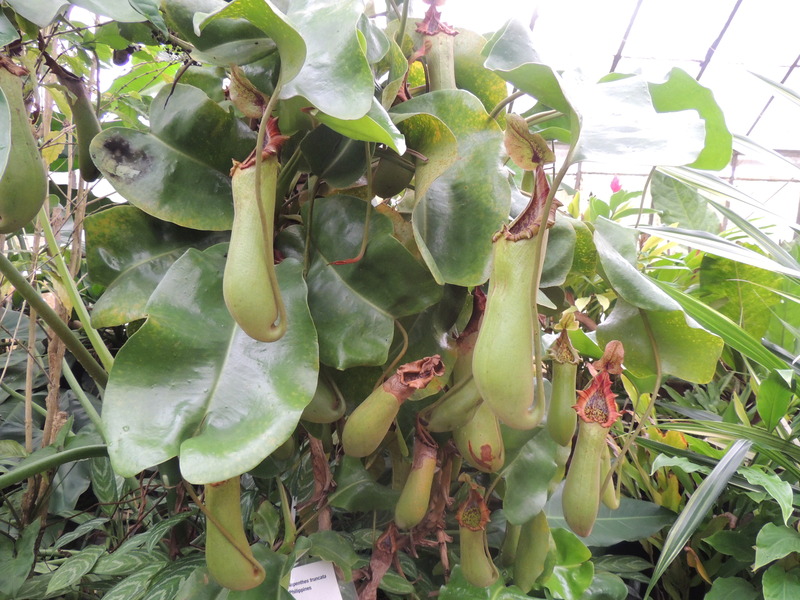 This pitcher plant (Nepenthes truncata: it had a label) has a leathery feel. 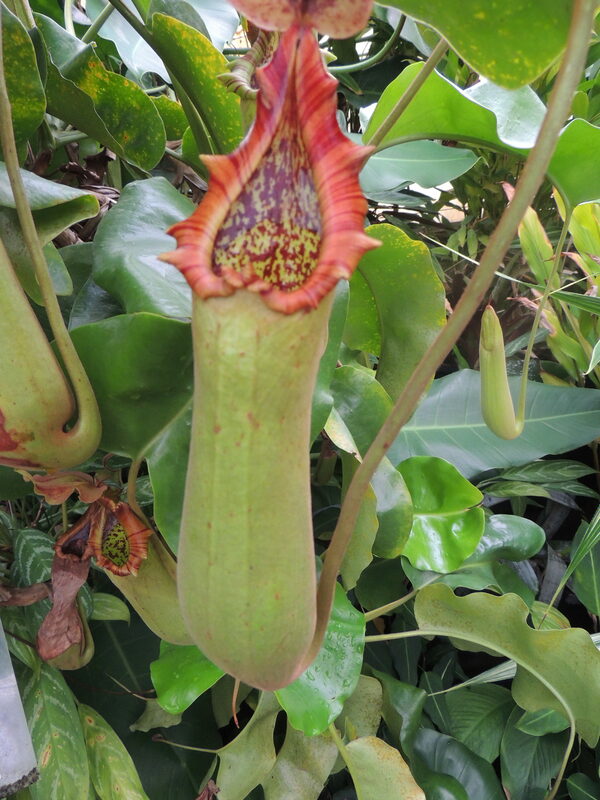 Those rolled rims around the top of the pitcher are slippery and insects, or sometimes even a mouse or a frog, slide down only to become trapped and digested in the enzymes at the bottom of the pitcher, providing food for the plant. The pitchers themselves look like quivers for Hobbits' arrows! If Hobbits had arrows. 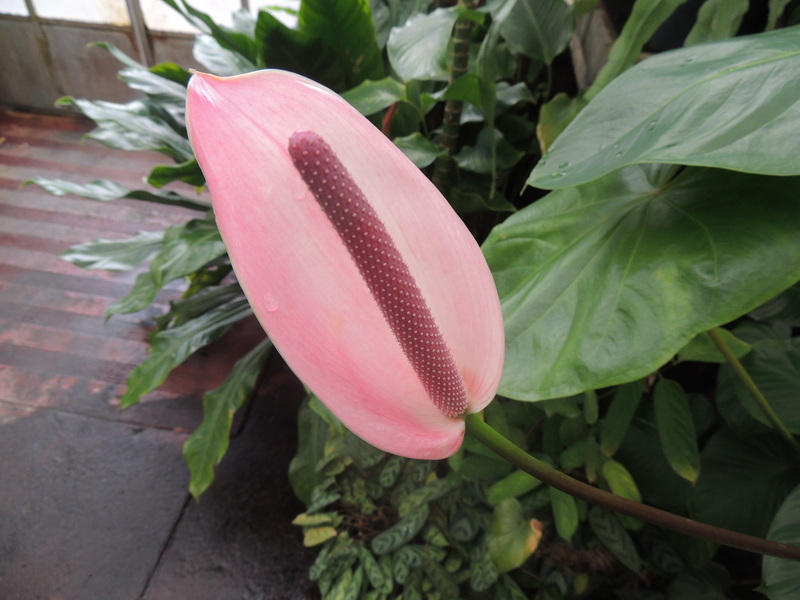 Anthuriums are also strange looking plants. 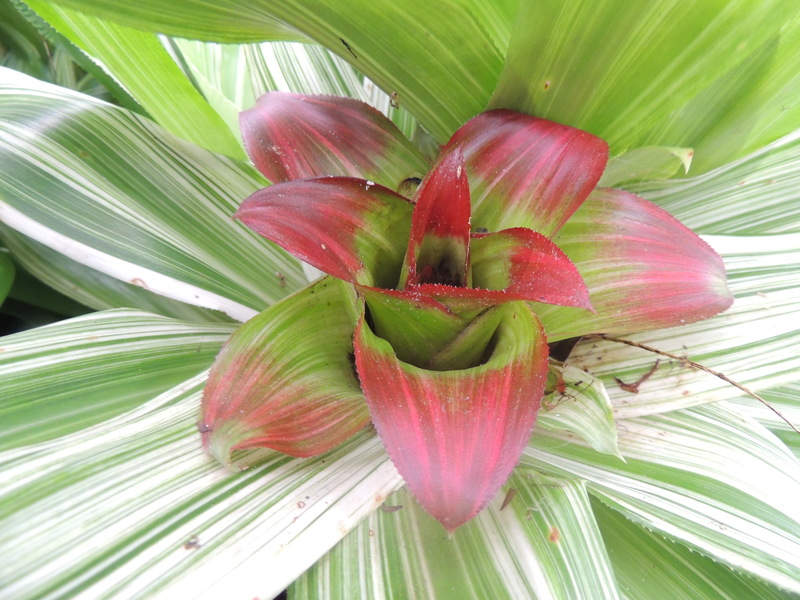 The brightly coloured waxy looking part is a spathe or modified leaf, and not ( as I had thought) a flower. 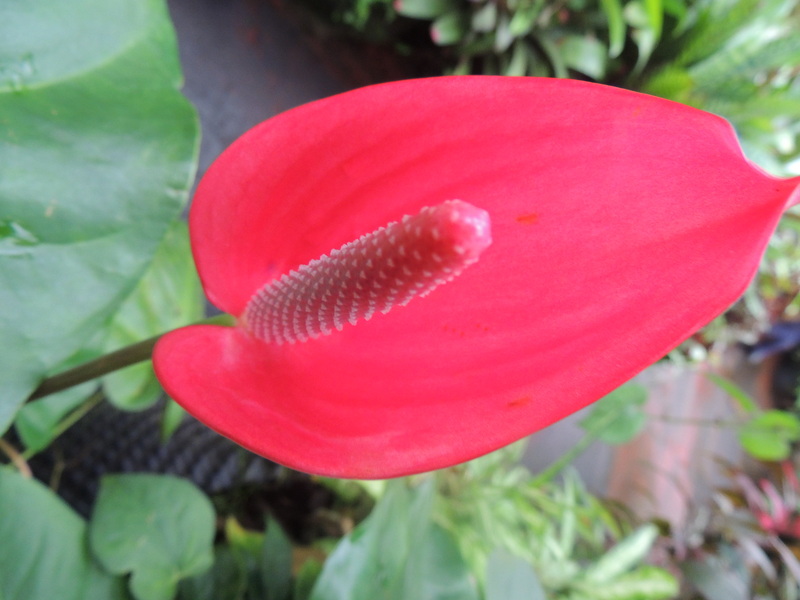 The tiny flowers can be found on the fleshy spike or spadix. 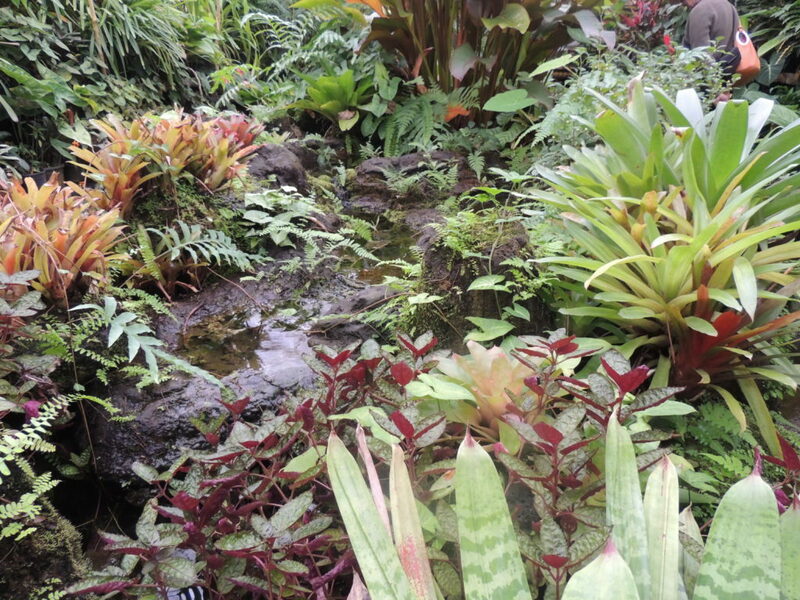 In the centre of the glasshouse is a trickling streamlet surrounded by many plants and rocks covered with small ferns, mosses and other damp-loving growths. I thoroughly enjoyed examining these microcosms with their different organisms. 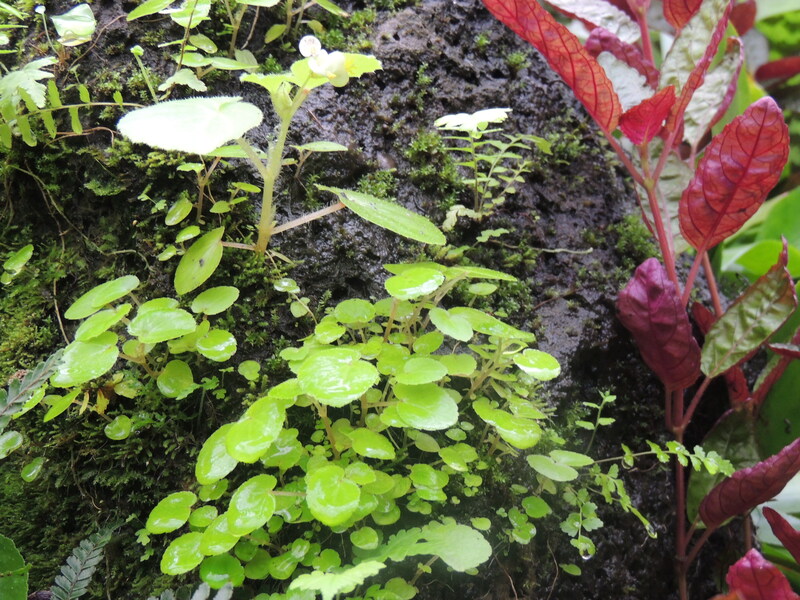 They're like a rainforest in miniature. Finally, a view of the interior of the glasshouse. I have discovered, too late, that there are two Titan Arums in there and can't believe we didn't see them. Obviously they weren't in flower, because I'm sure their putrid smell would have been noticeable. Botanical gardens usually have a glasshouse for visitors to wander through. Have you been to one you enjoyed? Lovely photos! When I lived in London I was only 10 minutes from the Royal Botaic Gardens Kew. I visited once or twice a week all through the year. I really miss the glasshouses, the Palm House, the Princess of Wales Conservatory and the Temperate House where 5 years of restoration have just been completed. Now I’m in rural France there are many compensations but Kew Gardens are one of the things I miss most about England. What a wonderful area to live in Christine! I can understand why you miss it. I have been to London, but not to Kew Gardens. Perhaps next time…. I thought you’d be able to grow those plants Pauline- I think I saw them in your monthly review. We wouldn’t be able to grow any of them here, only inside the house, or a conservatory. The angle you took your photos on is very interesting. It would be a bonus to be inside the glasshouse on a cold Melbourne day. Your photos are lovely, Jane. The rare times I’ve been there, it has looked rather messy and disorganised, but going by your photos it looks much tidier and the plants more visible. If you haven’t already done so, I highly recommend The Conservatory in the Fitzroy Gardens on the eastern side of Melbourne. 5 seasonal displays, but phone first to double-check it’s open as I’ve got caught out with the Conservatory being closed due to re-landscaping. Best to go when there aren’t any busloads of tourists too. It can get crowded. I’ll see if I can find some photos to put in a post on my Nature blog for you. Thank you, Vicki. Everything seemed well cared for when we were there. I don’t know when we’ll next be in Melbourne, but I’ll keep you suggestions in mind. In the meantime, I’ll look forward to seeing your photos. 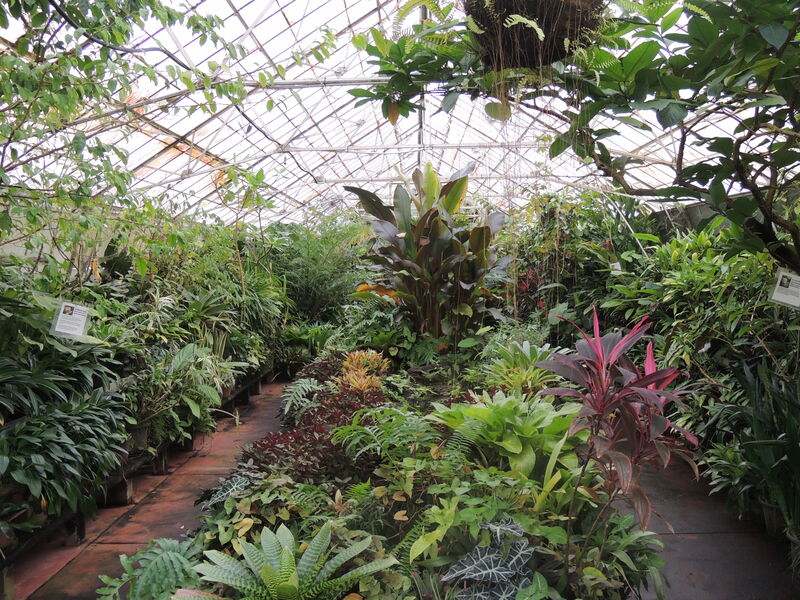 I always enjoy a visit to a glasshouse – though the humid ones can be a challenge. RHS Wisley (Surrey, just outside London) has a good one. I wasn’t that impressed with the Palm House at Kew, but the Princess of Wales conservatory is delightful. I loved the one at the Botanic Garden of Wales as it was like visiting the southern hemisphere. The Eden Project is my closest place for glasshouses – both tropical and Mediterranean biomes. None of these places are free to enter by the way and some can be very expensive to visit! Closer to you is the one in Auckland which is lovely and free! And I believe there is one in Sydney, but closed when I was last there. I have enjoyed reading your posts about the Eden Project,Jude. There certainly is a large tropical greenhouse in the Sydney Botanical Garden and I intend to visit there before too long. I always seem to have a lot to do when I go down to Sydney! I’ve been in the Auckland one, but that was long before I became a blogger. Thank you for your comments. There’s one in Washington DC that’s quite nice. My local botanic garden has a very small tropical greenhouse but yours in Melbourne is better by leaps and bounds. Believe it or not, I’ve been growing some bromeliads outside here. I started off putting them in pots under a large shade tree but last October I put some in the ground. This summer will be the first real test of how well they’ll do there – we don’t enjoy the moisture rich breezes off the oceans in our location that some nearby areas do. I think your bromeliads will manage, Kris, and I say that because I’ve seen them growing in dry shade in Sydney, where the weather can be very dry at times. Good luck with them. They are all beautiful but first 4 are amazing..! How could have they shaped and made such a patterns and colors which are just unique! Nature is amazing..! They’re fascinating shapes and colours Makiko and I expect there are many more in the wild. Thanks for your comment. What wonderful photos, Jane! The plants are amazing, it’s like going back into prehistory. Love the hobbit’s arrow quiver! We had a lovely day at the National Botanic Garden of Wales last year, the Great Glasshouse is the largest single span glasshouse in the world and houses plants from six areas of the world with a Mediterranean climate – including Australia! The warmth was very welcome on a bitterly cold March day, the scent of freesias was heavenly and the eucalyptus and Spanish heath reminded us completely of home. Great place. I would love to see the Great Glasshouse, Lis, it sounds amazing. Although interesting, the Melbourne one isn’t really very large. Thanks for your comments. This lovely post brought back such memories for me. I grew up in Melbourne and the botanical gardens were a Fourier place to visit. Mum and my nan were both avid gardeners. Later, when I had a garden of my own, I used to take my girls there for outings. There is so much to inspire. I still think they rival gardens I’ve seen in other countries. Your photos are lovely Jane. 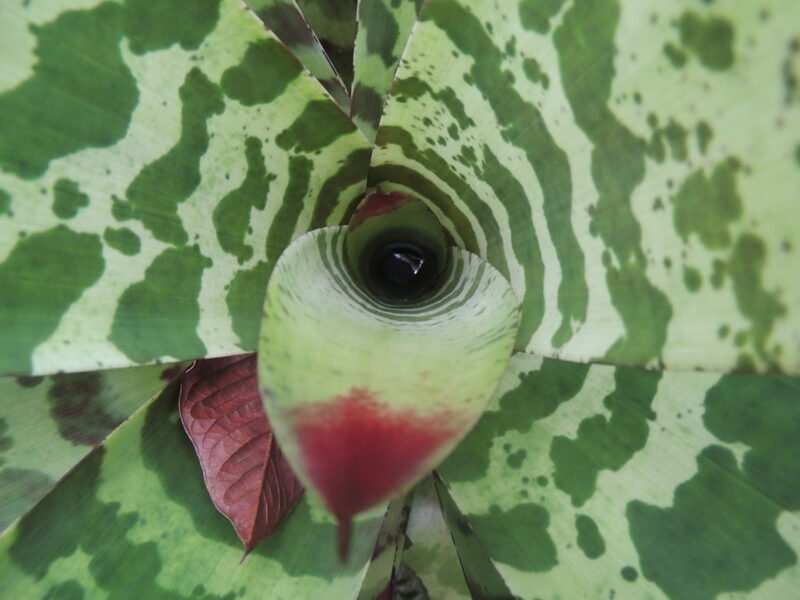 I grown some of the bromeliads you have taken photos of. I’m glad the post brought back such happy memories for you, Robyn. I’m sure many of the plants in the glasshouse would be familiar to you, living where you do. Perhaps I’ll see some of them in your posts! Thanks for the comments. Our local botanic Garden is very disappointing and is only open spasmodically. Last week there was a plant sale but very few sellers attended. The rose colonnade was the most spectacular feature and that looked good. Your BG by contrast looks very exciting; thank you for the tour. I’m glad you enjoyed it, Christina.